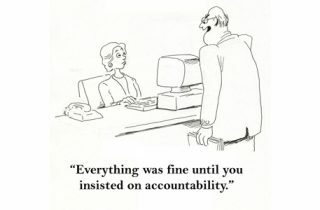 Accountability is a key concept underpinning leadership. But how do you manage people when they sit at different levels of accountability? We look at how your behaviour needs to adapt to each level when you’re a leader. Level 1: You resist or avoid being held to account, ‘because of the circumstances’. You say, “It’s not my job”; “She made me do it”; “It isn’t my fault”. Level 2: You’re willing to be held to account by others, ‘subject to the circumstances’: “It was the traffic”; “I couldn’t, because…”; “They didn’t come back to me in time“. Level 3: You’re willing to be held to account by others, ‘regardless of the circumstances’. You don’t make excuses – ever! Check which boundaries of accountability are being resisted. Agree what the results of the accountability are (SMART objectives). Give reassurance and offer your personal support. Give your personal support and monitor closely. Give recognition when the accountability is fully accomplished. Meet to discuss the ‘hows’ of the accountability and listen for perceived obstacles or possible excuses. Gain agreement as to how obstacles will be overcome or avoided. Emphasise the importance of success. Offer your personal support if needed (‘open door’) and monitor. Give praise for milestone achievements. Monitor to ensure focus is kept on required outcomes only. Offer your personal support if needed.